December 18, 2018, Las Vegas, Nevada – Dignity Health-St. Rose Dominican Hospitals had much to celebrate November 30. During a special ceremony at the San Martin campus, the hospital re-dedicated its Responsible Early Detection (RED) Rose program for women facing breast cancer as the Engelstad Foundation RED Rose Program. 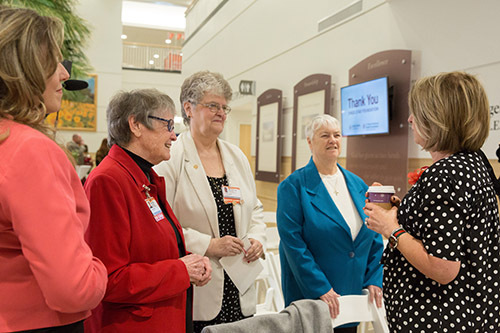 From left, Sisters Kathleen McGrail, OP, Phyllis Sikora, OP, and Carol Elya, OP, speak with other participants at the re-dedication of the RED Rose program. A generous endowment of $10 million by the Engelstad Foundation ensures that the hospital will continue to provide detection, diagnosis, treatment, and financial services for years to come for uninsured, underinsured, and undocumented women facing breast cancer. Sister Monica Stankus, OP, then Vice President of Mission, started the program in 2001 to ensure that women without adequate insurance receive the treatment they need in their fight against breast cancer – as well as financial support if they cannot hold down a job while receiving treatments. Sister Monica died on December 26, 2016. Sister Monica’s foresight has since helped thousands in need of this support. Since its launch, the program has provided 3,748 mammograms, 3,076 ultrasounds, 739 biopsies, and 88 breast cancer diagnoses. The program has been blessed with dedicated clinical partners who donate or provide discounted services to help make the hospital’s funds go further and treat more clients in need. “How Sister Monica must be smiling down upon us all,” said Sister Kathleen McGrail, OP, Vice President of Mission for the Siena Campus.